Easy Slots players, join the dwarves on their adventure with the Dwarves Gold Deluxe Slot where you can join the cheery characters and collect gold along the way. Powered by Pragmatic Play, this slot features fun dwarf character symbols, superb graphics and great ways to win. Players can enjoy spinning this online slot for as little as 1p per spin and up to 50p per spin. The auto-play button lets players set the reels in motion then sit back, relax and watch the reels spin with no interruption. Pragmatic Play is a software development company that have over 80 casino games available on mobile and desktop devices. They are one of the leading development companies for casino games even though they are recently new to the iGaming industry having only started the business in 2015. Based in Malta, their main focus is online slots and have some popular titles including Hot Safari, Sugar Rush and Magic Crystals. You can visit here for more games from Pragmatic Play. 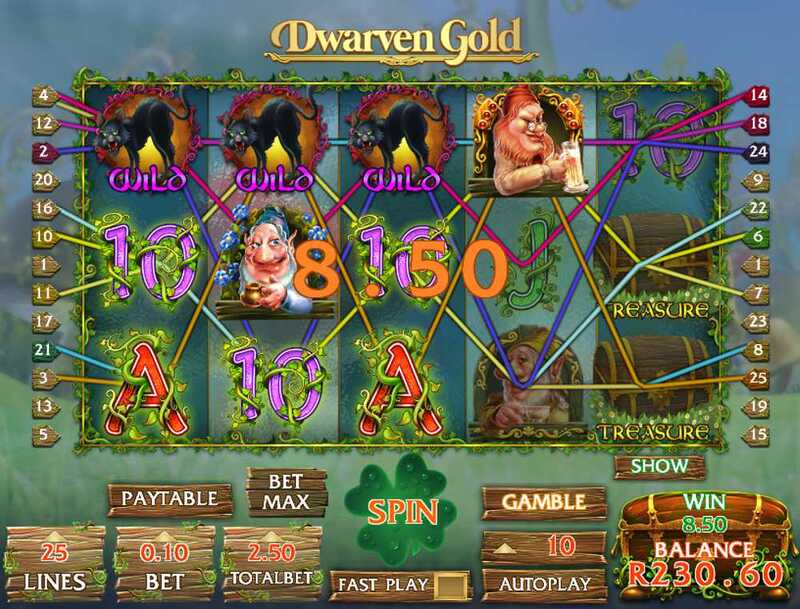 Dwarven Gold Deluxe Slot takes players along for the adventures of the cheery dwarfs that appear not the reels. The online video slot has fun sound effects, beautiful graphics and smooth animations providing a memorable and entertaining gameplay. Enter the fantasy world where you will become best friends with dwarfs and collect pots of gold. The game's theme and design is set in the dwarf village where you will see the small and cute houses in the background. With a unique and vibrant theme, this slot is a memorable game suitable for players of all interests and abilities. The symbols include classic playing card numbers and letters (10, J, Q, K, A). These symbols are the most common and also the lowest paying symbols to land on the reels. They can pay out as little as 2 coins up to 150 coins when landing combinations of 3 or more. The other symbols include the 4 different dwarf characters and the treasure chest which can reward 20 through to 1000 coins. The wild symbol for this slot game is the pot of gold. It can payout big if you land 3 or more and will also place any other symbol other than the scatter, to form winning combinations. The scatter symbols is a red butterfly symbol and can land on reels 2, 3 and 4. Landing 3 or more scatter symbols and you will trigger the bonus round where you will be given 7 free spins. Once activated, players will be shown a new set of reels where 2 extra wilds are added at the beginning each spin and will stay stacked until the feature ends giving you chance to win significantly increase your winnings in the bonus round. More information about mobile slot deposit. The Dwarven Gold Deluxe Slot is waiting for you to join the dwarfs on their adventure to find gold. With plenty of bonuses and free spins available here, there is plenty of chance to leave this fantasy land with pots of gold. 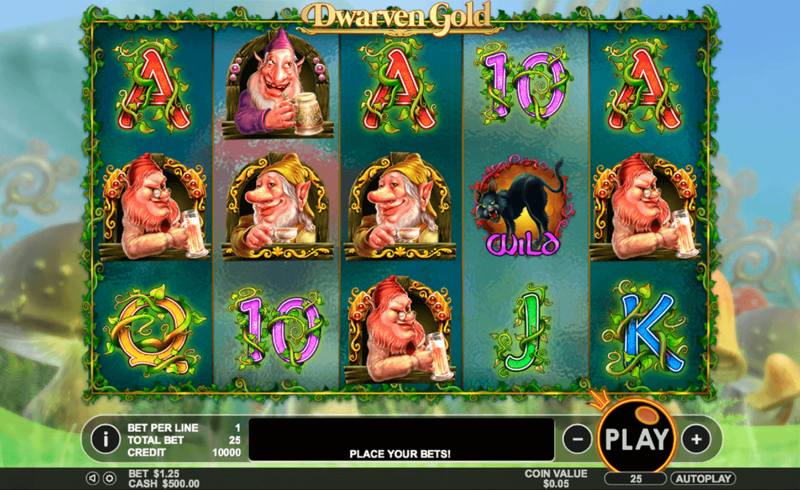 If you enjoyed Dwarven Gold Deluxe playing why not try another online slot, click now!